Outside Austin City Hall, the rain poured down…but inside, the biggest EcoRise event of the year shone bright with success. On May 31, the 2nd Annual Citywide Eco-Audit Student Showcase wrapped up yet another year of exploration and ingenuity. Delegations from nine schools set up exhibitions for over 22 projects – funded by Eco-Audit grants in 2015-2016 – all along the main atrium while student presenters, dressed in their best, proudly showed off their hard work. 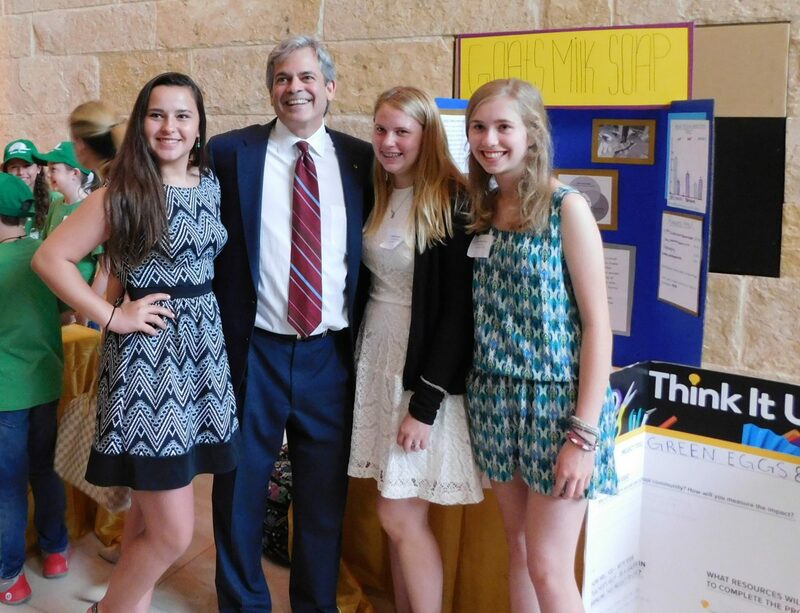 Visitors, families, teachers, community partners, fellow students and even Mayor Steve Adler strolled around to ask questions, pose for pictures and enjoy the exhibits. Some students were also interviewed by The Austin-American Statesman. Students and Eco-Audit projects are carefully selected for the quality of their work to present at the Citywide Showcase. This selection is an honor and an opportunity for schools to share their implementations of practical solutions to environmental challenges. 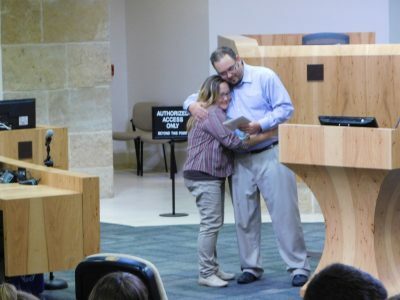 In the council chamber, EcoRise staff offered thanks to all participating teachers and educators for supporting their students in these projects, as well as to Lucia Athens and Mary Priddy of the City of Austin’s Office of Sustainability. 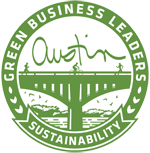 The Austin City Hall building, itself a model of sustainable urban architecture, was the perfect place to host the work of the next generation of sustainability leaders. One of the big moments of the showcase was awarding Dr. Shannon “Doc” McPherson with the 2015-2016 EcoRise Teacher of the Year Award. Student presenters from her Cedar Park High School Eco-Audit class, who had been awarded two grants and implemented multiple campus improvement projects, applauded as she accepted her plaque and thanked them for their hard work. Then all the students in the chamber rose together to receive a round of applause. 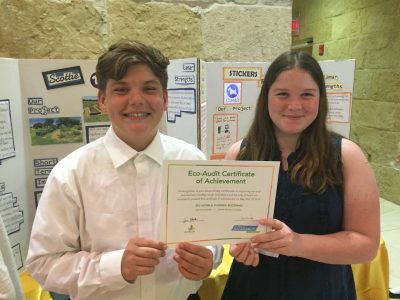 As a result of their Eco-Audits, students presented solutions ranging from a campus recycling program to a goat’s milk soap business, from a sticker campaign and school blackout day for energy-saving awareness to water catchment systems, from waste prevention videos to beautiful and bountiful school gardens. Congratulations to this year’s Citywide Showcase schools for their Eco-Audit projects! Cedar Park High School, Leander ISD: Recycling Campaign and Gardening Essentials. Small Middle School, Austin ISD: Low Flow Faucets, Mills Garden, Succulent Garden, Goats’ Milk Soap. NYOS Charter Public School: A Decomposer’s Hideout-Improving the Compost at NYOS, Water You Doing for the Earth? Campus Improvement Project. Hill Elementary School, Austin ISD: Aware Armadillos-Thinking Before We Throw. Patton Elementary, Austin ISD: Monarch Heroes, Energy Audits, Battery Drives. Matthews Elementary, Austin ISD: Grover’s Waste Clean Up, Trash to Treasure. Bertha Sadler Means, Austin ISD: Energy Audit, Solar Charging Station. Lamar Middle School, Austin ISD: Worms for Compost, Blackout Day, Waste Watchers, Scottie Water, Stickers for Saving.